Consumers shrugged off the October government shutdown, boosting retail sales above expectations. Together with the strong third-quarter GDP reading, surging retail sales offered further evidence that the private-sector led recovery is pressing forward despite budgetary confrontations on Capitol Hill and the headwinds they have been creating. As the clouds surrounding sequestration and the government shutdown dissipate, the dire forecasts by lawmakers have proven mostly overblown. Although some hurdles loom on the horizon, namely another budget standoff after the holidays and the impact of the Affordable Care Act on consumer spending, the combination of positive indicators in recent weeks will encourage the Fed to consider tapering asset purchases sooner rather than later. Core retail sales grew 0.3 percent in October, while overall retail sales expanded 0.4 percent as strength across a broad range of sectors prevailed. In fact, only gas stations and building materials stores dragged on growth during the past month, and neither decline is indicative of weakness in the overall economy. Lower fuel prices weighed on sales at gas stations and pulled down the Consumer Price Index 0.1 percent during the month. Building supply stores, meanwhile, lost momentum as home sales slackened amid elevated home prices. The recent run-up in home values and a drop in distressed sales to 14 percent of transactions moved many home investors to the sidelines, resulting in a sharp decline in sales at building materials stores. 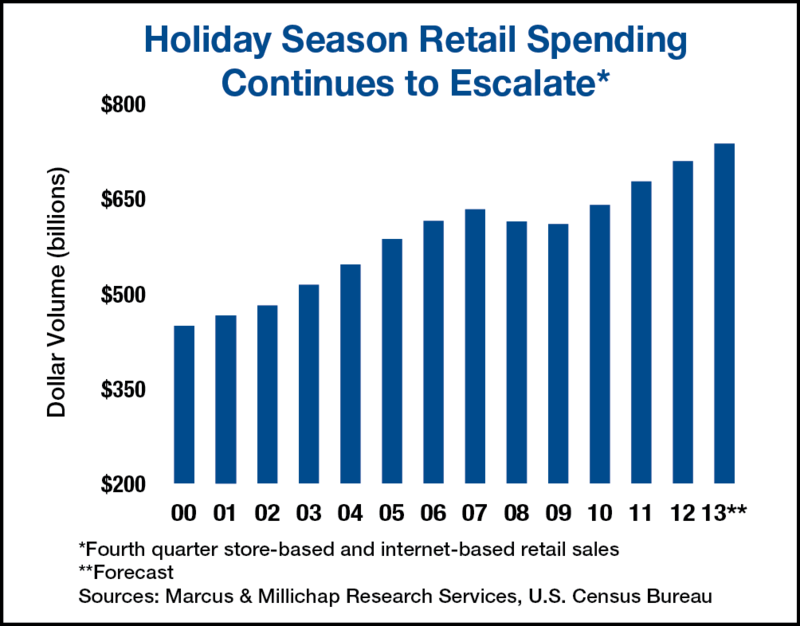 The sharp increase in retail sales during October has boosted retailers’ confidence ahead of the holiday shopping season. Although retailers will have one less weekend during this year’s holiday shopping season, the dip in fuel prices and wealth-effect from higher home values should propel holiday sales forward by nearly 4 percent from last year. Still, the gains will likely be uneven as wage growth has favored the upper scales of the income spectrum. Year over year, retail sales advanced 3.9 percent, lifting total sales more than 20 percent above the recessionary trough. Space demand has climbed slightly more than 3 percent during that time, indicative of the significant supply overhang and soft absorption in many markets. Store openings will chip away at dark space in the coming months, pulling down vacancy into the mid-7 percent range by year end and into the low-7 percent area during 2014. Existing home sales fell by 3.2 percent in October as higher mortgage interest rates caused some potential buyers to pause. A further escalation in interest rates may keep additional renters from purchasing a home, which will dampen the effect of more than 200,000 rentals anticipated for completion in 2014. Nonetheless, apartment vacancy is anticipated to rise modestly in the fourth quarter and next year. This entry was written by marcusmillichap, posted on November 21, 2013 at 10:19 pm, filed under Uncategorized and tagged CRE. Bookmark the permalink. Follow any comments here with the RSS feed for this post. Post a comment or leave a trackback: Trackback URL. Frankly, I do have plenty of reasons to be optimistic about the real estate market (especially here in Florida) in 2014. In fact, a recent report suggested that Florida could regain it’s old title as the housing market to watch in 2014. Now, I also have some concern over the recent debates concerning the Biggert-Waters Flood Insurance Reform Act. Those proposed hikes could give many buyers reason to pause or lose interest altogether.